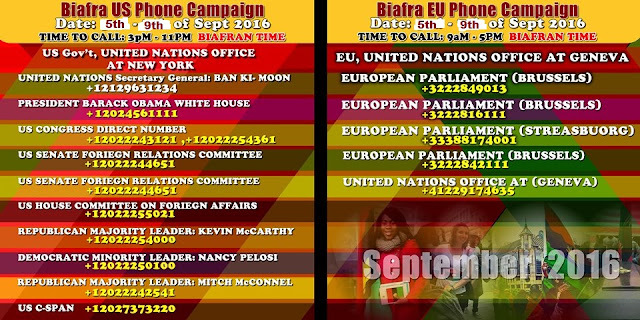 This September 5th to 9th; Biafrans and friends all over the world will commence another round of phone campaign to officials of United States of America (USA); European Union (EU) and United Nation (UN). As free and peaceful people that have refused to lift a stick or raise a gun in spite of all the provocations so far; the military action against the lawful people of Biafra has been sustained. While there is an intense move to silence and extinguish Biafrans; in good faith and with the hope that the world authorities will stand to defend the international conventions that propel the Indigenous People of Biafra. It is, therefore, imperative to know that Biafrans have endured so much and now exploiting every civil means to get justice. This September call is done that there may be justice and a halt to the right violation that has faced them. As this extermination continues; it is noteworthy that the people of Biafra have committed no crime known to any law but have thrived on freedom of speech which has brought death and mayhem upon them. While this is the case; they have been conspired against, and everybody has gone deaf and dumb while a part of the world is about to be extinguished. The killing of six million Jews started just this way, and negligence tends to play a remarkable role in abetting such evil against the people of Biafra. While there is visible genocide in Biafra; it is believed that calling the world or international community will trigger sympathy and awaken the consciousness of men to the inhuman State treatment of Biafrans. A call from you can save humanity and a people faced with a second genocide. The more there is silence is the more this ongoing genocide is sustained, and there is need to intensify the call for justice to the international community and world relevant authorities. The non-violent approach applied by Nnamdi Kanu and the Indigenous People of Biafra means every alternative must be exploited to save humanity from extermination. This call for justice must be given every attention needed and to enforce due action to arrest the lawlessness that has narrowed Biafrans to animals whose rights are not respected or a species of terror. Having arrested Nnamdi Kanu the leader of Indigenous People of Biafra, the call for his unconditional release has been sustained and met with unwarranted military action against the people of Biafra. ISIS- like execution of the people of Biafra is now rampant with Amnesty International on top of the game they know how best to play; browsing and uncovering the genocide going on in Biafra and reporting to the world- details of how Biafrans are shot without provocation. Forceful disappearance is the order of the day, and there seems to be no end to this evil against Biafrans. This evidence via report from leading human right institution buttresses the position of the people of Biafra who has been crying day and night over the genocide being perpetrated on them. It is the collective responsibility of the entire people of the world to stand and fight for the safety of people without any record of provocation or threat but people that have contributed immensely to the development of the world at large. Nnamdi Kanu who has been in unlawful detention has rigorously been pleaded and forced to renounce or negotiate with FG of Nigerian which he obviously declined and reiterated that it is Biafra or nothing. While there is no hope of Buhari breaking him; they have intensified their move and have attempted to murder him the second time in the space of one year. Spain is not killing Catalonians and UK is not killing Scots; why then must Nigeria kill Biafrans. 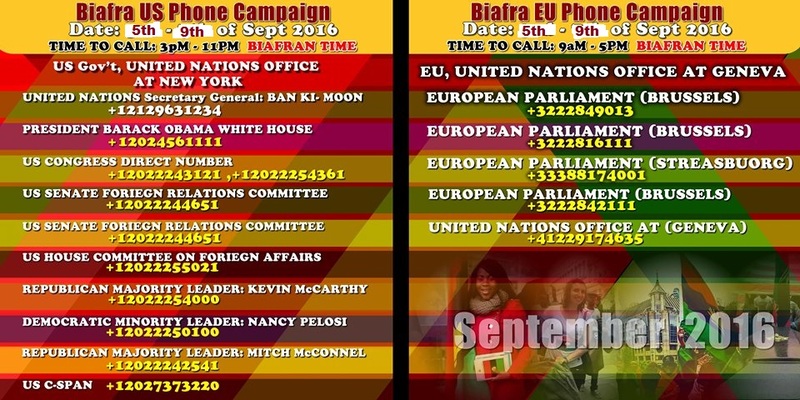 Through this call, the world should be made to know that the people of Biafra deserve equal treatment with other human beings. Nigeria must be rebuked and condemned; there should be compulsion for the release of Nnamdi Kanu and halt to the military action against unarmed people. It is clear that Nigeria is a lawless state and would do nothing but contravene its laws and constitution let alone respecting international conventions. For this reason, it is crucial to remind the world of the role they should play when human rights that are protected without boundaries are abused by a State. Therefore; it is overdue for the world authorities to step up and compel Nigerian State to respect what she signed to respect. The 2007 UN declaration on the rights of Indigenous People is a sacred convention and must be respected or compelled to be respected if need arises. 1. Nnamdi Kanu’s right is being violated without constraint by asking him to renounce a legitimate demand before he is released. This simply shows that he is being held by no law but by Nigeria (a man) who has no right to his life and freedom. Ask them to help in working to free the leader of Indigenous People of Biafra (IPOB), Nnamdi Kanu – the prisoner of conscience. Tell them how he was illegally abducted for exercising his right under United Nations rights of Indigenous peoples and self-determination. 4. Tell them how Biafrans are made to suffer in their land by the evil Nigerian state; and that Biafrans are looking up to them, to use their good offices in helping for the restoration and independence of Biafra.